Welcome to my gallery of needle felted dolls! Felt Alive original needle felted dolls are each hand-sculpted from wool batting using barbed felting needles with no sewing, no stuffing, no wire armatures and no paint! Even their eyes, teeth, clothing, hair and accessories are needle felted wool. The dolls stand, flex and bend nearly like they are alive. A li’l Whoopie! Needle Felted doll. this is my original Whoopi – I made her on commission for a fan of Whoopi. Here is a talented and fun group of musicians with their mini Felt Alive dolls. As a longtime fan of The Who, this project was such a thrill for me – and would you believe that I didn’t know Rab owned a red and black western shirt until I saw this photo? Uncanny, is what I say! When Rab’s doll arrived early in the morning, he dug through his closet to find his matching red shirt to pose for a photo for me! (Can you see his pajamas under his shirt 🙂 Thanks for being such a great sport, Rab!! 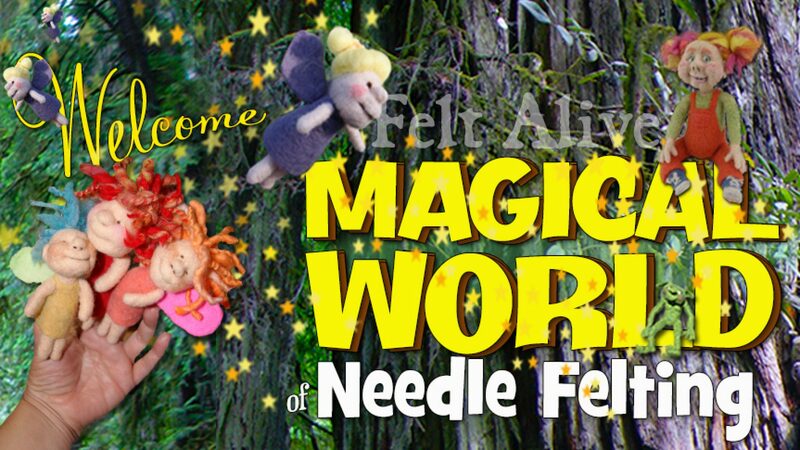 Felt Alive needle felted wool dolls are made without the use of wire armatures! He stars in this original Felt Alive Production. Trump’s comb-over is hilarious on his 4-wheeling adventure with li’l Conan O’Brien. The Beatles are some of my earliest caricature work. What can I say? She’s my li’l rock star for sure! What fun it was to bring Conan’s quirky look to life in needle felted wool! Li’l Conan dreams of meeting Big Conan some day! And check out Li’l Conan’s epic adventure ice fishing here in Alaska! The needle felted bear was made by me especially for this video. My nephews, Nick and Ben Petal, made the stop-motion animation video. Clips of this video have appeared on The Conan O’Brien Show! I’ve been a fan of Willie for many years and it was a great thrill to bring him to life in wool! I actually grew up with Sarah in Wasilla, Alaska. She was my very first celebrity caricature doll – I made her during the election in 2008 and sold her on eBay to a political doll collector. And that’s concludes my collection of celebrity needle felted dolls but stay tuned – there will be many more! This is Saige and Li’l Saige! Gabe & Carly and their li’l wedding couple. The next group of needle felted dolls are purely from my imagination! And if you want to learn how to make needle felted creations of your own, I offer several fun workshops of my designs. She has some attitude for sure. And like all of my dolls, she is fully jointed with a natural range of motion. And she stands on her own without the use of wire armatures – all without sewing even one stitch! This little guy came to life while I was teaching a 3 day long doll workshop! My student’s tell me he looks like Clint Howard, Ron Howard’s brother. Needle Felted Wool Doll Jim Timmie came to life while filming my needle felted dolls video workshop. That’s why he has one shoe on and one shoe off! I had to demonstrate making both bare feet as well as feet with shoes. Needle Felted Wool Doll This is as close to a self portrait as I’ll likely ever get. I was a mushroom in a ballet when I was 5 years old. A first Felt Alive Doll with removable dentures! And One Dog Led to Felt Alive PUPS! This is my needle felted tribute to the late, great Marty Feldman. His Igor character in the comedy Young Frankenstein is just classic! the following photos are of my earliest projects. Soft sculpted little girl – she is holing her little teddy bear. I made this little girl for a charity auction so her name is up to her new family. I set out to make a sweet little cupid and this rather silly looking character showed up instead. The song “Stupid Cupid” kept running through my mind as I created him. This little pair was donated to a charity auction. I made this for a felting challenge. This is little Hazel. She sits about 6 inches tall. She is wearing a yellow dress. Click the link to watch a video! Santa is about 20 inches tall. He is enjoying some down time in his red long-johns and wool socks. This is Chieder. Check out his video! This couple is young at heart. And yes, it’s true Granpa’s in his Superman Underoos! Make sure to watch their video! My niece named him after my late father. The resemblance is a bit uncanny! She doesn’t have a name – my niece just calls her Grandma. The sexiest distance between two points is a curve! I made Hailey in a workshop. She was supposed to be sunbathing but really, she looks better flying. I made Kleebus in a class with Birgitte Krag Hansen. He is quite a character. The class was Funny Theatre Figures. Here is a needle felted over wire armature caricature of Albert Einstein. This is Skye – A very early work. She is over a wire armature. Her handbag is needle felted as well. This is my little tribute to my home town’s sled dog racing heritage. I even needle some of my husky mutts’ fur into the little dogs. These are my first attempts but I think there can be no doubt where I got my inspiration. Photos taken in my front yard. I have never seen such clever work in needle felting!!! They are all nothing less than amazing !!! Beautiful, whimsical and spot on in their physical looks. Your work is just so passionately crafted, it will be my go to for inspiration for sure. Can’t wait to start use your videos to make my pieces come to life as yours. One of my better addictions for sure. Your work is amazing. Do you sell any f it? Thanks Joan! Mostly I keep my dolls but I do make custom dolls from time to time. Thanks Shelly and welcome to the club! It’s a great addiction and I know you are going to love it! Hi Kay My dream is to make dolls as professional as yours. I would love to win a doll like this. Where’s the great Howard Stern?? Hi Kay, Just fallen onto your site while felting your little Pixies. I am speechless with awe and wonderment. Hi, I just noticed I could leave a comment here. Sorry I didn’t see this sooner, as I have jusy emailed you. Well now I know and next time I will comment here.